The objective of these reports is to provide users with a means of assessing the relative condition of crops and grassland. The maps can be used to assess current plant growth rates, as well as comparisons to the previous year and relative to the 24-year average. The report is used by individual farmers and ranchers, the commodities market, and political leaders for assessing factors such as production potential and drought impact across their state. NOTE TO READERS: The maps below represent a subset of the maps available from the EASAL group. If you’d like digital copies of the entire map series please contact Kevin Price at kpprice@ksu.edu and we can place you on our email list to receive the entire dataset each week as they are produced. The maps are normally first available on Wednesday of each week, unless there is a delay in the posting of the data by EROS Data Center where we obtain the raw data used to make the maps. 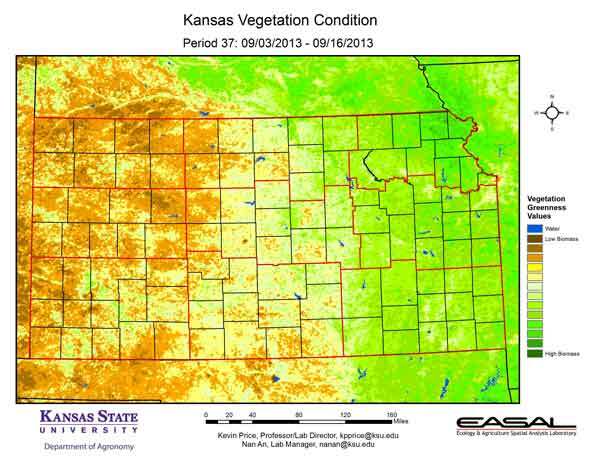 These maps are provided for free as a service of the Department of Agronomy and K-State Research and Extension. Figure 1. 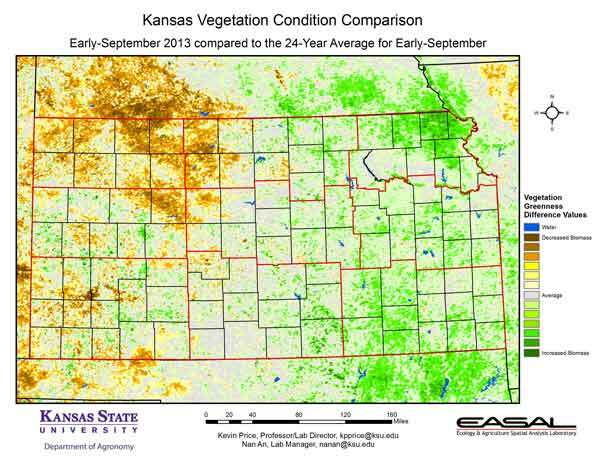 The Vegetation Condition Report for Kansas for September 3 – 16 from K-State’s Ecology and Agriculture Spatial Analysis Laboratory shows that photosynthetic activity continues to decrease from west to east. The greatest activity continues to be in the extreme northeastern counties, particularly Brown and Doniphan. Figure 2. 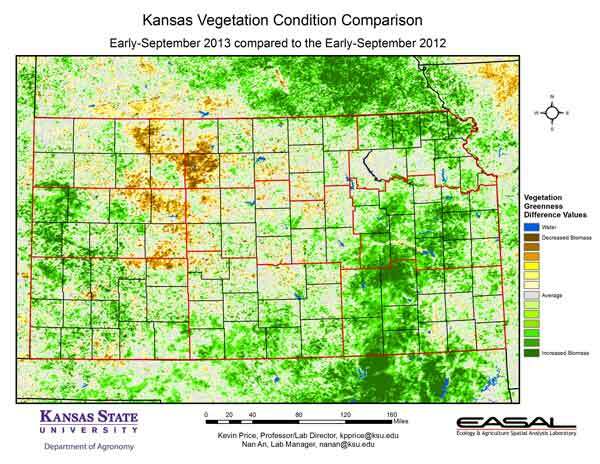 Compared to the previous year at this time for Kansas, the current Vegetation Condition Report for September 3 – 16 from K-State’s Ecology and Agriculture Spatial Analysis Laboratory shows that much of the state has higher biomass productivity than last year. The Flint Hills region, in particular, is showing much greater photosynthetic activity as the grasses have benefitted from recent rains and warmer weather. Rooks County, on the other hand, has much lower photosynthetic activity. Figure 3. 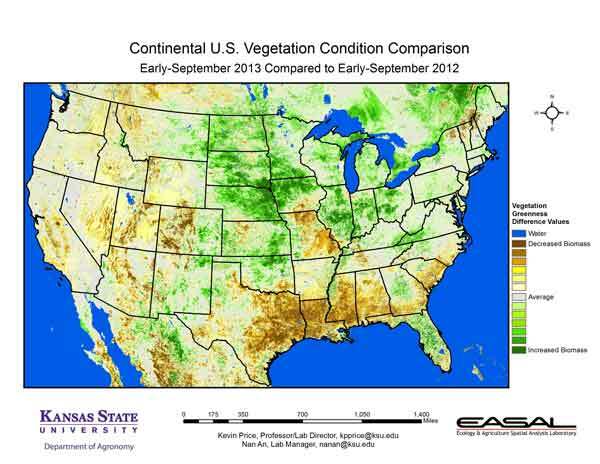 Compared to the 24-year average at this time for Kansas, this year’s Vegetation Condition Report for September 3 – 16 from K-State’s Ecology and Agriculture Spatial Analysis Laboratory shows that while most of the state is at or above average in productivity, parts of the northwest and north central continue to have much lower biomass productivity. Southern Phillips and northern Rooks counties are particularly low. Figure 4. 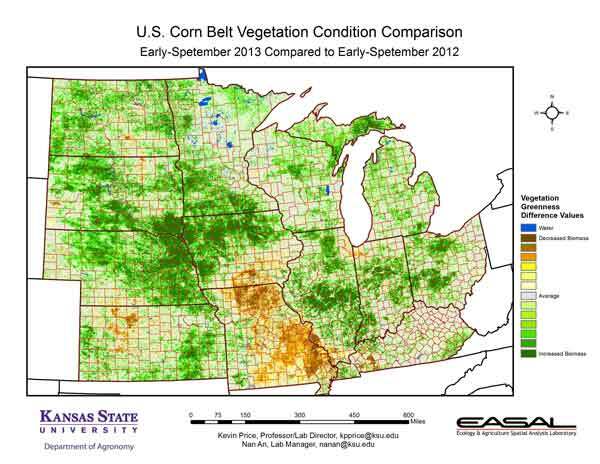 The Vegetation Condition Report for the Corn Belt for September 3 – 16 from K-State’s Ecology and Agriculture Spatial Analysis Laboratory shows that southern Iowa and northern Missouri stand out for low photosynthetic activity in the otherwise active eastern part of the region. Northern Wisconsin and the Upper Peninsula show much higher-than-average photosynthetic activity. Late-developing crops are contributing largely to this increase, while drought and heat stress are the major factors in Iowa and Missouri. Figure 5. 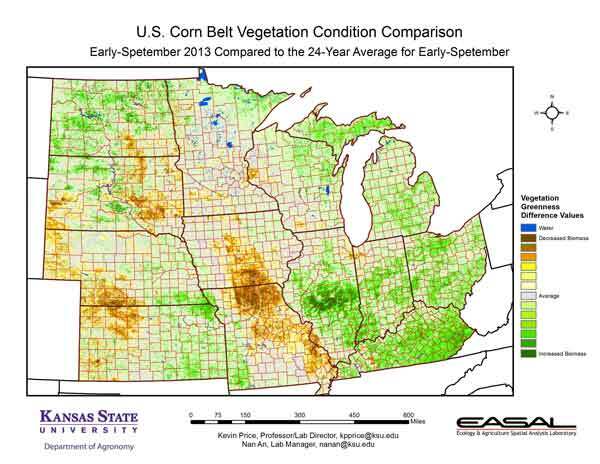 The comparison to last year in the Corn Belt for the period September 3 – 16 from K-State’s Ecology and Agriculture Spatial Analysis Laboratory shows that Missouri and Iowa are the main area of lower productivity. In contrast, northwestern Iowa and the border between South Dakota and northeastern Nebraska are the focus of much higher NDVI values. Temperatures and precipitation in these areas are much more favorable than last year. For Missouri, the extremes in moisture this year have had a negative impact. In the northern areas of the state, very dry conditions have prevailed over the last 30 days, while the southeastern portions of the state have dealt with excess moisture and flooding. Figure 6. 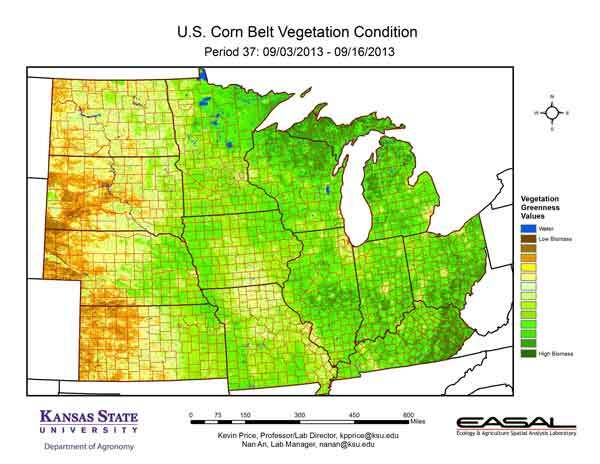 Compared to the 24-year average at this time for the Corn Belt, this year’s Vegetation Condition Report for September 3 – 16 from K-State’s Ecology and Agriculture Spatial Analysis Laboratory shows that pockets of much higher-than-average NDVI values are in very close proximity to areas of much lower-than-average productivity. Central Illinois has one of the largest increases in biomass production, while northern Missouri has one of the largest decreases in photosynthetic activity. There is a splice line on the western edge of that region, due to cloud issues. Figure 7. 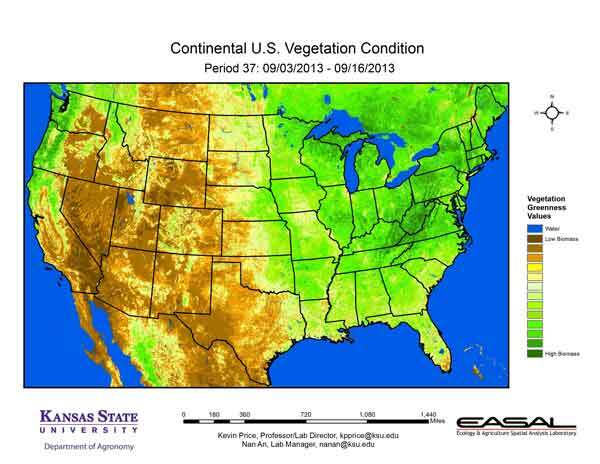 The Vegetation Condition Report for the U.S. for September 3 – 16 from K-State’s Ecology and Agriculture Spatial Analysis Laboratory shows that eastern Kentucky and West Virginia are the high spots for photosynthetic activity. In West Virginia, 85 percent of the soybeans, 84 percent of the corn, and 81 percent of the pastures are reported in good to excellent condition. Western California and southern Nevada are the regions with the least photosynthetic activity. Figure 8. 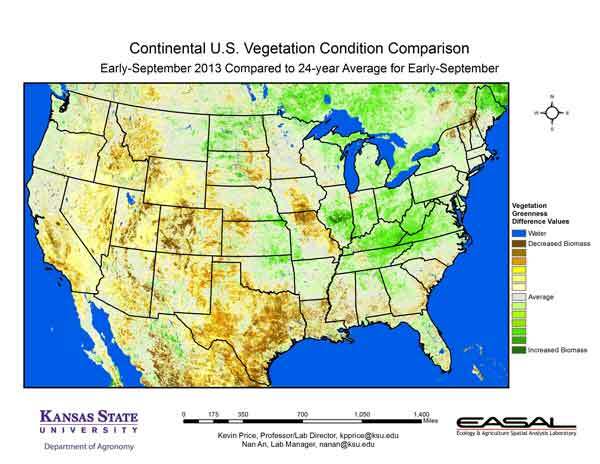 The U.S. comparison to last year at this time for the period September 3 – 16 from K-State’s Ecology and Agriculture Spatial Analysis Laboratory shows that the largest area of lower biomass production ranges from east Texas to Alabama. Extreme drought continues to influence the region. Figure 9. The U.S. comparison to the 24-year average for the period September 3 – 16 from K-State’s Ecology and Agriculture Spatial Analysis Laboratory shows that areas of extreme rainfall show up on these maps as the darkest brown. This is particularly evident in parts of Colorado and along the Texas coast, where rainfall amounts in excess of 5 inches lie next to areas that saw less than a quarter of an inch. Meanwhile, the yellow to brown areas of Missouri are regions feeling the impact of low rainfall and above-average temperatures.